A recent Northwestern University study has revealed more about why some seniors have higher memory function than their peers. The study found that SuperAgers (defined as “people older than 80 with an episodic memory at least as good as that of the average middle-aged adult”) have a thicker brain cortex than their peers, resulting in higher memory function. These findings open the door to further research on brain function in seniors, especially those at risk of dementia and Alzheimer’s. 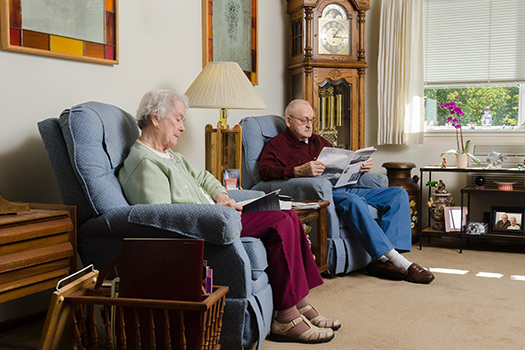 Seniors with dementia or other types of cognitive decline can benefit from at-home care. If your senior loved one needs professional in-home care in Harrisburg, Pennsylvania, Home Care Assistance is here to help. We are a trusted provider of respite and 24-hour care, and we also offer specialized Alzheimer’s, dementia, Parkinson’s, and stroke care for seniors. The Northwestern paper’s senior author, Emily Rogalski, stated that MRI studies revealed a decrease in thickness of the cortex of 1.06 percent in the SuperAgers, compared with 2.24 percent for the control group. Age-related cortical atrophy is considered normal and plays a role in the decrease of cognitive function with age. By studying the brains of SuperAgers, scientists hope to uncover other biological factors that might aid in the preservation of memory among other seniors. Caring for a loved one with dementia can be challenging at times. If you are the primary caregiver for a senior family member and you need respite care, Harrisburg, PA, Home Care Assistance is here to help. Our respite caregivers are trained to assist older adults with a wide variety of everyday tasks, including meal prep, physical activity, and personal hygiene. We also provide 24-hour care and specialized care for seniors with Alzheimer’s, dementia, and Parkinson’s. Research conducted by Lisa Feldman Barrett at Harvard University in 2016 found that SuperAgers tended to push past their comfort zones in intellectual as well as physical pursuits. This approach to life can have a positive impact on the executive functions performed by the brain’s prefrontal cortex. MRI imaging supported Barrett’s assertion that a senior’s need for achievement can bolster the regions of his or her brain that help maintain cognitive abilities, such as the midcingulate cortex and the anterior insula. The data in both studies explain why the brains of SuperAgers are capable of higher functioning than those of their peers. The conclusions bolster the hypothesis that there may be ways for seniors who are not SuperAgers to take preventative measures. These studies also provide tools for caregivers to use in their daily interactions with seniors who have dementia. Recovering from a stroke, managing the symptoms of Alzheimer’s, and a variety of other health-related situations can make it difficult for a senior to continue living at home without someone there to help. Harrisburg, PA, live-in care professionals are trained to help seniors who need 24/7 assistance. With the help of a live-in caregiver, your elderly loved one can maintain a higher quality of life while aging in place. To hire a dedicated caregiver for your loved one, call Home Care Assistance at (717) 540-4663 today. How Does Depression Lead to Alzheimer’s?